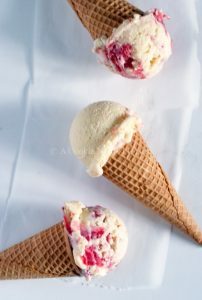 Creamy and decadent strawberry rhubarb ice cream with bright bursts of fresh fruit. This ice cream is my summer's theme. Satisfy every sweet tooth and stay cool with this gorgeous dessert. In a large pot, mix the milk, cream, 3/4 cup of the sugar, salt, and corn syrup together on medium heat. Bring the mixture to a boil for about 1 - 2 minutes, then lower to a simmer. In a small bowl, mix the egg yolks, 1/4 cup (50 g) of sugar and corn starch. Slowly add 1 cup (250 mL) of the heated milk to the eggs to bring up the temperature. Mix the eggs back into the pot. Mix the contents of the pot constantly until it forms a thick custard. You can test this by dipping a wooden spoon in the mixture, then running your finger down the back of the spoon. If a line where you swipe remains there, the custard is ready. It should take about 5 minutes. Stir in the vanilla. Prepare an ice bath - it should be more ice than water. Fill a large freezer bag with the custard and let it rest in the ice bath for about 30 minutes. Make the strawberry rhubarb swirl by adding all the ingredients in a medium pot and cook until the rhubarb is soft and a syrup has formed. Mash the strawberries and rhubarb, leaving a couple of small chunks in if you want more texture. Place in a bowl and refrigerate. Put the cooled custard in your ice cream maker and prepare according to manufacturer instructions. Layer the strawberry rhubarb and ice cream in a container, starting with the strawberry rhubarb mixture. Freeze for an additional 3 - 4- hours. *If you do not have an ice cream maker, place the ice cream in a container and place in the freezer. Every 30 minutes for about 3 - 4 hours, mix the ice cream. Be sure to scrape the sides and bottoms to break up the ice crystals. Use am immersion blender if you have one available.